Grand piano covers for all makes of pianos, made using the finest of materials. 2. Mackintosh: a canvas-like material made with a combination of a tightly-woven cloth joined to a soft flannel backing. Anything spilled on vinyl can be easily cleaned. Will not absorb or stain readily. Can be dusted easily, wiped with a damp cloth or vacuumed. Ideal for restaurants, bars, or any situation where people are likely to set a drink down on the top of the piano. If you have sunlight hitting your piano, avoid vinyl and get Mackintosh, as vinyl absorbs heat. Anything spilled on Mackintosh will be absorbed if not quickly blotted. As a thick and tough fabric, there is a weave so dusting with a duster is difficult. Cleaning recommended by wiping with a damp cloth. Not washable or dry cleanable. Vacuuming is the only effective means of cleaning. Least likely to snag with contact from rough or sharp objects. Very tough and durable - well suited for use in schools, churches, theaters and studios. Ideal for protection where pianos are subject to heavy sunlight or moisture. Available with the option of 3 locking straps. Made in the USA by industry standard leaders, Paul Jansen & Son. 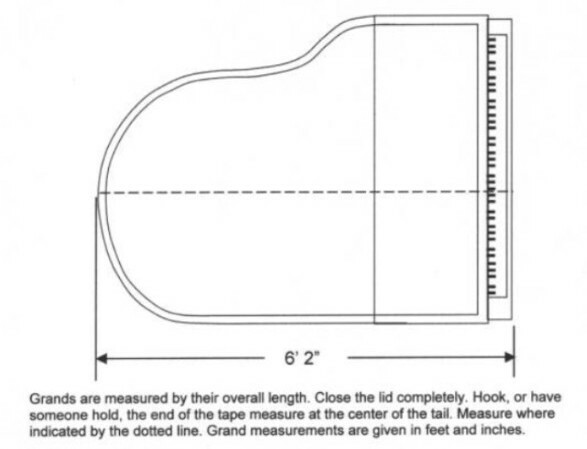 *CAREFULLY MEASURE THE LENGTH OF YOUR GRAND PIANO. WITH BOTH THE TOP LID AND KEY LID CLOSED, MEASURE FROM THE VERY FRONT EDGE TO THE TAIL END OF THE PIANO.